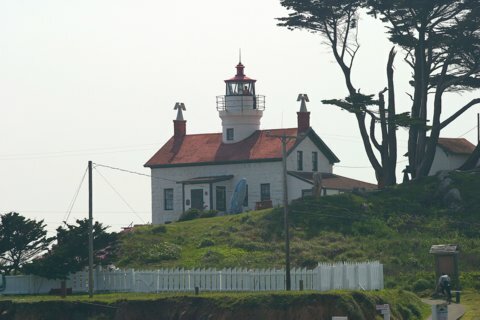 Many consider the highlight of Crescent City to be Battery Point Lighthouse. Isolated on a vulnerable island that can only be reached during low tide, this lighthouse has faced horrible weather throughout the years, including an overwash by a tidal wave back in 1964. Despite the weather conditions, this unique lighthouse continues to send its strong beacon out to sea to help guide those trying to find their way. First lit on December 10, 1856, Battery Point now stands as the fifth oldest lighthouse on the West Coast. It was automated in 1953, and discontinued entirely in 1965. However, in 1982, it was reopened by the Del Norte County Historical Society and continues to shine as a private aid to navigation. The Historical Society also maintains a Maritime Museum in Crescent City, working to honor the history of the lighthouse and the surrounding area. Looking for a place to eat while in Crescent City? We stopped off at the Surfside Grill & Brewery on 400 Front St. You should go by it on your way to the lighthouse. Really good beer and good food. From the south take US 101 into Crescent City. Take a left onto Battery St.
A St. will bring you to a parking lot. If the tide is low you can walk across the rocks and sand over to the lighthouse. Be watchful of the tides so you don't get stuck on the island!